In the festival circuit, there’s always that one show that’s not like the others. In the landscape of the 2016 Frigid Festival, that show is Supershock vs. Faust. Billed as a “movieconcert”, Supershock vs. Faust is the antithesis of theater. 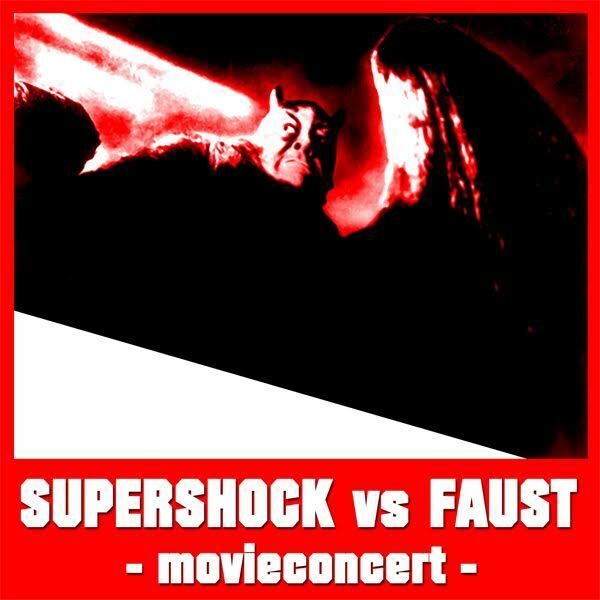 Appearing more like performance art, Supershock vs. Faust takes the silent film version “Faust” by Murnau while rock musician Supershock provides a live underscore. The juxtaposition between era and style ties into a thematic night of multi-disciplinary performance. For those who may not know the silent film, demon Mephisto places a bet with the Archangel that he can corrupt a righteous man. Mephisto finds his victim in an alchemist named Faust who tempts him with his powers of youth, wisdom, and love. In the end, love triumphs and the devil loses his bet. Murnau’s film is terrifying. The cinematic classic features some frightening characterizations and themes. Combining a metal score underneath actually is fitting. But the trouble of Supershock vs. Faust is what the focus of the piece is. Supershock is the star of the show yet he positions himself on the side of the stage with his electric guitar and distortion pedals while the movie is projected on a screen at the back of Under St. Marks. With concert in the description, we want to see the music maker. If Supershock places himself in front of the screen, we’ll still be able to see what we want rather than having to choose. Be prepared. Supershock vs. Faust is not like any other show in the festival. The moral of the story is don’t trust the devil, no matter what. Even if he tempts you with a repetitious night of music.